“She became a better student, she became a better person. Her whole life changed when she joined this program.” 2006 Sun Community News Papers. Scott Sutphen. Malibu father of 15 yr old bassist Sage. In our music lessons studio everyone participates in and encourages… Teamwork, Respect, Patience, Focus, Kindness, Honesty and Support. Join the Band® was created by Los Angeles guitarist and instructor John Mizenko. A graduate of Boston’s Berklee School of Music, John has enjoyed a successful career as both performer and educator. He takes great pride in his students, and strives to help them develop both their potential as performers and their enjoyment in playing music. After many years of successful private music instruction. John recognized the need for his individual guitar students to experience playing with other musicians in a band setting. These music classes quickly grew into Join the Band®. The first official concert was held at Full Blast Rehearsal studios in Van Nuys with three bands on Saturday, November 8th, 1998. Join the Band is celebrating over 16 years of offering band performance classes and private music lessons. We are the orginal band performance program in Los Angeles. JTB has more experience than any other studio running band performance classes and private music lessons. We believe we are the best based on what our students say. Visit our Google Review Page and our testimonial page for their comments. We offer private music lessons, band classes, music camps and workshops. We’ve had over 1000 bands perform over 1,500 different songs, played over 93 concerts with over a thousand students (Band Members)! We currently average over thirty bands a session and have performed at clubs throughout Los Angeles including The Knitting Factory, Whisky A Go Go, Roxy Theatre, The Mint, The Federal Bar, Cozy’s, The Baked Potato, Amazon Bar and Grille, and Smoking Johnnies. 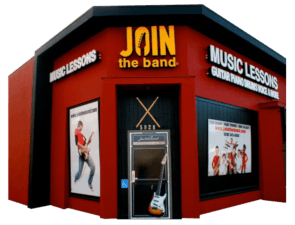 Our Join the Band studio location offers private music lessons on guitar, piano, drums, voice, bass and more. Jam Fest (Music Cares Benefit) With Bridges Academy, New Community Jewish HS, Harvard Westlake, Crossroads School, and Campbell Hall. Temple Aliyah, and many more.